With increasing frequency many of us walk into the voting booth facing a severe lack of interest or even a distaste for the candidates before us. Whether this is because “our guy” lost in the primary or we live in an area of one-party dominance, the situation remains the same: we simply don’t want to vote for any of these people. That’s why I believe it’s time for Ohio to implement a statewide “none of the above,” or NOTA, option for all state and local elections. There are many good reasons for (and even few against) such an idea, but I truly believe that once in place it will do more to strengthen our system than weaken it. The NOTA ballot option I’m proposing would be non-binding and merely serve as an outlet for those feeling that no one on the ballot represents their interests. It could also serve to officially register a vote of no confidence in cases where the race is uncontested. Currently the only alternative to endorsing candidates we don’t wish to endorse is to skip an entire election. This is out of the question, however, since far too many people have fought and died to preserve our democracy. Here is where a NOTA option comes into play. There are many places in Ohio where one political party holds dominance over the entire electoral landscape. Most of our urban areas have become reliable Democratic strongholds and their outlying suburbs tend to lean strongly Republican. Ohio’s counties & townships tend to lean one way or the other as well. In many areas the “real” race often takes place during the primary with the subsequent general election being just a formality. Often in these situations minority parties offer up a token candidate just to hold the ballot for the appearance of competition, or to bleed money from the majority party. Implementing a NOTA option will not change any of those lopsided situations, but it would interject a new dynamic into the race: removal of an assumed political mandate and perceived popularity. Many times politicians let it go to their heads that the vote totals they receive (portrayed in percentages) imply a mandate from the people to carry out their campaign platform, construe winning percentage as a popular endorsement. for their positions They feel they can then speak with authority that x% voted for them and that they’re just doing their job in our representative democracy. Hogwash. Imagine what would happen in a county commission race where local groups or associations urged their followers to show up at the polls and choose NOTA. Let’s say that turned out to be 40% of the total vote, with the winner also getting 40% and the minority party’s token candidate barely getting 20%. Would you want to be that commissioner? Sure, you won, and at the end of the day you’re in power, but to have that outcome hanging around your electoral neck would not be reassuring—especially the next time you ran for office and someone took you on. Another aspect of elections that NOTA would improve is the candidate selection process. Often, especially in lopsided areas, parties themselves offer up weak, unelectable, or simply terrible candidates. Parties do this for various reasons, but mostly it’s done to offer up a semblance of competition. Sometimes they field no one at all (enter those infamous back-room deals), treating voters as mere rubber stamps. With a NOTA option on the ballot, voters could express their displeasure at both the candidate who will likely win and the half-baked one running against him. They can simply choose “none of the above” and hope enough people share their desire to kill two birds with one stone. In the case of a single candidate with no competition, a NOTA vote could send a loud & clear signal of no confidence. Moreover, having NOTA on the ballot gives new political power to groups and associations, especially those with a large membership. This newly injected political capital could be the deciding factor in a close race. It might even force the candidate to actually listen to currently ignored constituencies and adopt positions that are in line with their membership. Cincinnati presents an example where NOTA could make a difference, or at least make things more interesting. This year Cincinnati (a Democratic stronghold) will be electing a new mayor. A special primary was held in September, and the top two candidates will face off in November. Not surprising, two well-known, well-funded and powerful Democrats emerged victorious. There were four candidates in the officially non-partisan race. One was a perennial, libertarian-leaning candidate; the other was a complete unknown. There were no Republican candidates in the race. Voter turnout was an anemic 5.7%, and the taxpayers (as always) had to foot the bill to the tune of $477,000 (another story for a different day). 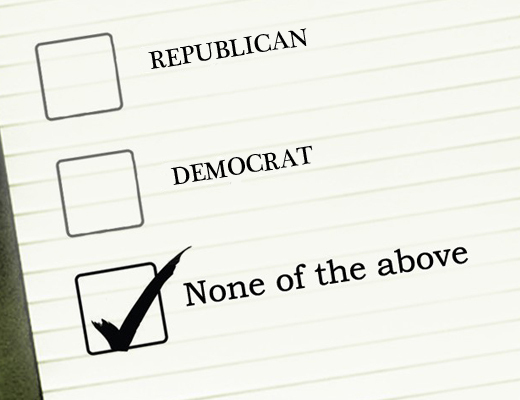 Had there been a NOTA option on the ballot, however, various interest groups and organizations, like the local Republican Party, could have encouraged their supporters to turn out and vote for “none of the above.” If this block were significant enough it would send a shockwave to the candidates, forcing them to compete for their vote, or at the very least to give them an audience. Why? Because the Democratic base will be split and there will be no room for error. Most political observers expect it to be razor-close, ultimately coming down to just a handful of voters deciding the outcome. If you’re one of the two candidates, you know that every vote will count in this election and that building as broad of a coalition as possible is the only way to win. That means reaching out to the political minority and those on the margin. The NOTA option would inject new political energy into disparate and otherwise marginalized groups of people. In other words, their vote would no longer be taken for granted simply because they’ll be voting for the lesser of two evils. In addition, more people might actually turn to out to vote because for once, their voice would truly be heard and not just assumed, and not washed into the statistics of being a non-voter. Ohio needs a NOTA on her ballots. An all-around vote of no confidence needs to be an option, because a vote of confidence should never be an assumption. Brad Beckett is a political consultant living in Cincinnati, Ohio. He has been working professionally in the public policy arena for nearly 18 years at both the local & state level. Related on OCR: Read all articles by Brad Beckett here.